The end of the financial year is looming here in Australia, which is known to instil fear into the strongest creative minds. 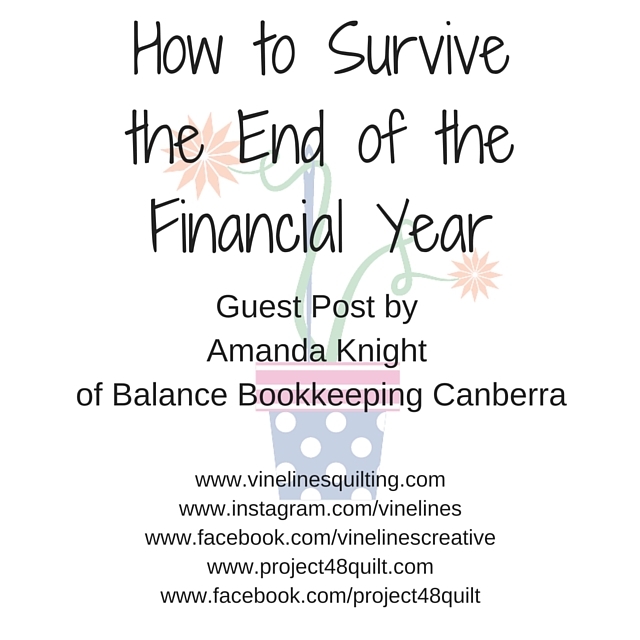 I’ve invited my good friend and bookkeeper, Amanda Knight of Balance Bookkeeper to give us some quick tips about how to stay sane at EOFY. If you need some assistance with your bookkeeping, I highly recommend her – her contact details are at the bottom of the post. Without further ado, herewith your sanity saving tips for EOFY. So, you are really creative and inspired by creating but the thought of end of financial year just makes you want to cry. Well, I am the opposite; the thought of sewing on a button either makes me cry or put the pair of pants in a safe place never to have the button reunited to the item. I am going to share with you some tips on how to make the end of financial year good even if you don’t like the number stuff. (If you haven’t had a system for this financial year you can easily set one up and then you can carry this forth to the new financial year and onwards). But what does a system entail? The word sounds scary but it could be something as easy as an Excel spreadsheet that keeps track of your expenses and income, or it could be something like Xero (www.xero.com) where you can have your bank account synced so you can ensure that you never miss an expense. This could be a shoebox, electronic storage or in your inbox. Have you recorded all of your expenses that you can claim: education, conferences, training, office expenses and accountant fees from last year? I don’t know about you but I blink and time just flitters away. So don’t delay and start today!! Setting yourself up right for the new financial year is going to save you in the long run. Put a system in place, work out when you are going to sit down on a regular basis and then plan to do it by scheduling it into your diary. Reward yourself – have a reward system in place for when you accomplish the task and be proud of what you have achieved. Have an amazing end of financial year and may you and your businesses continue to be successful!! I’ve been on quite a finishing binge lately. I’ve got quite a few half-finished quilts floating around which I want to get finished so I can start on some more new projects. I’m dreaming up new patterns to write as well as wanting to make some patterns I bought during May is for Makers. The two I’ve been working on this week are both for the small children, who are rapidly becoming bigger children! Little Boy loves Thomas the Tank Engine. 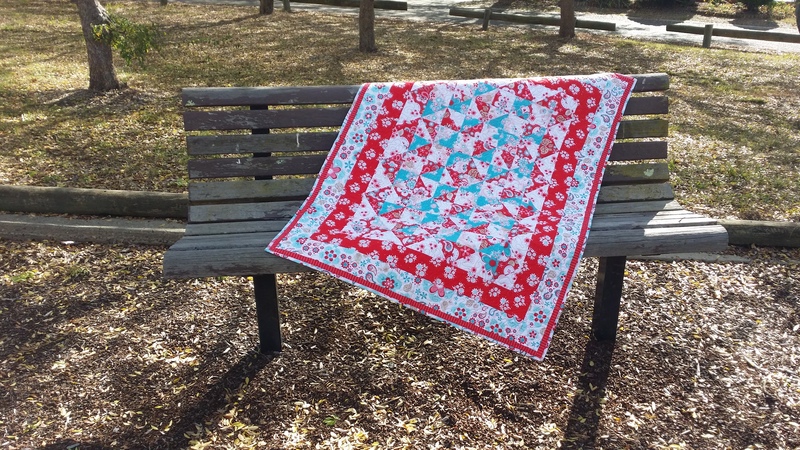 A number of years ago I bought a half yard bundle of Thomas-themed fabrics from Fat Quarter Shop and when Alyce from Blossom Heart Quilts released her Bright Sky pattern last year, I knew it would be perfect for those fabrics. 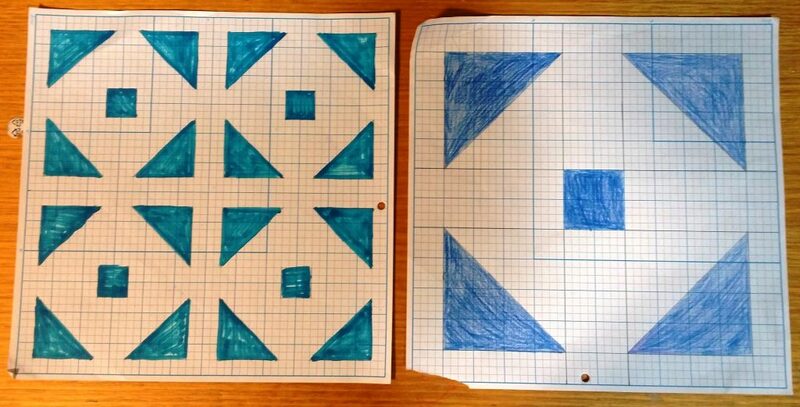 I’ve finished piecing the sections and will now quilt them then join them using the QAYG method. 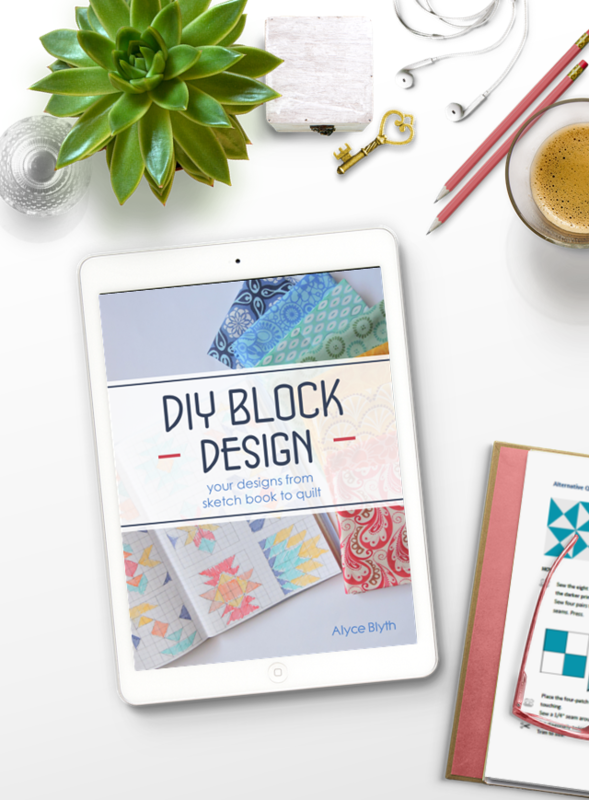 Alyce’s pattern is perfect for showcasing your favourite prints; you need at least fat quarter sized pieces (I had half yards) of each print. It comes together very quickly and is great for practising QAYG. You do have to watch your seams as you’ll be working with bias edges a lot. I would definitely recommend using starch or Best Press. I bought this panel – also a few years ago – from The Oz Material Girls. I didn’t really know how I was going to quilt it but ‘had’ to have it. 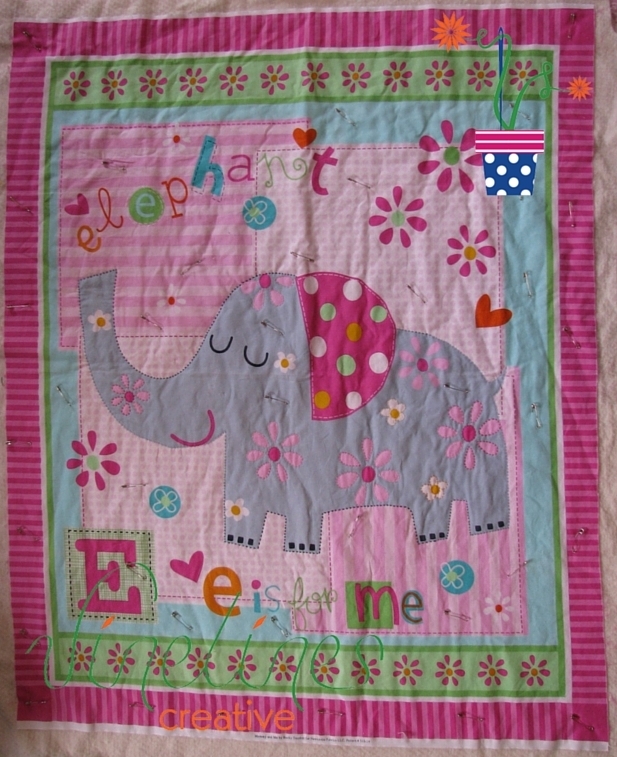 My daughter’s name starts with E and she has a couple of toy elephants so it was perfect for her. 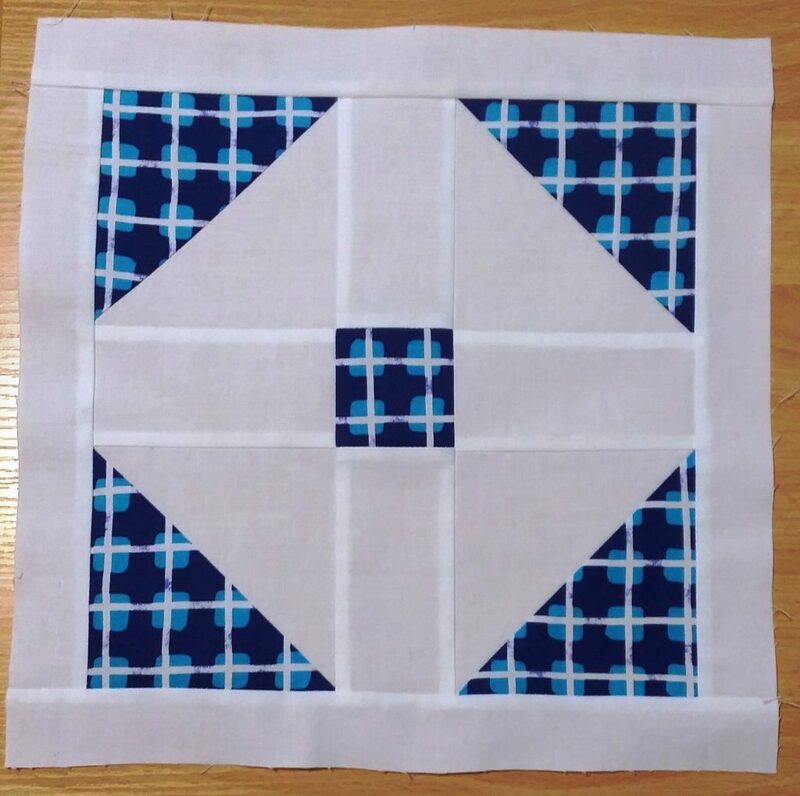 Recently, after many years of vowing I would never try hand quilting, I decided it was time to give it a go. I really love the look of chunky hand quilting so I bought some Perle 5 threads and away I went. After a few hitches trying to find a suitable needle, I went with Clover Sashiko needles and they work a treat. I’ve finished the elephant and am making my way around the flowers. It’s a long term project but I do hope to finish it before Christmas 2016. In other news, Moira of Quilt Talking recently posted a photo of a quilt which was hanging on a photography frame. 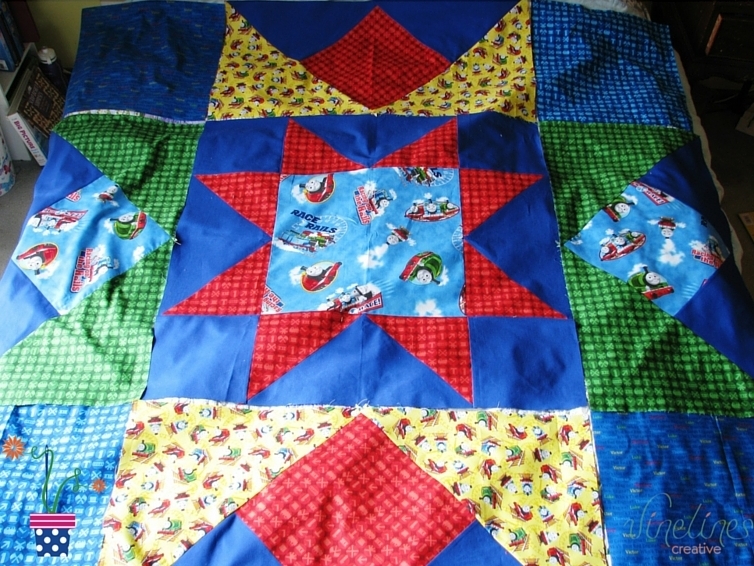 I found it on EBay for under $50 so my quilt photos from now on should look much nicer, and more professional. I’ll be hiring it out to Canberran quilters too so drop me a line if you’re interested in hiring it for a day or a weekend. 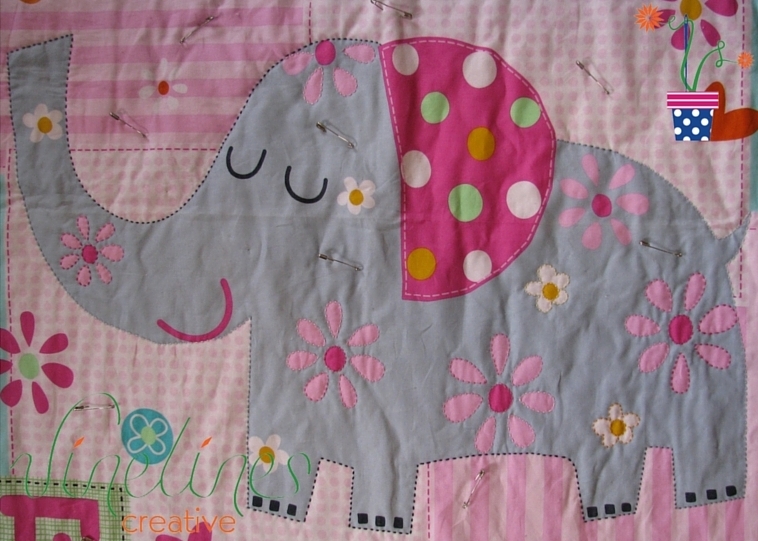 I’m linking up with Sew Cute Tuesday over at Blossom Heart Quilts. I’ve been sewing for as long as I can remember but curiously never with knits. Recently I was inspired to do so but had a couple of false starts. The first garment I made, I sewed with the stretch going the wrong way and the second I used the wrong stitch on my machine so the seams have all gathered and look unsightly. 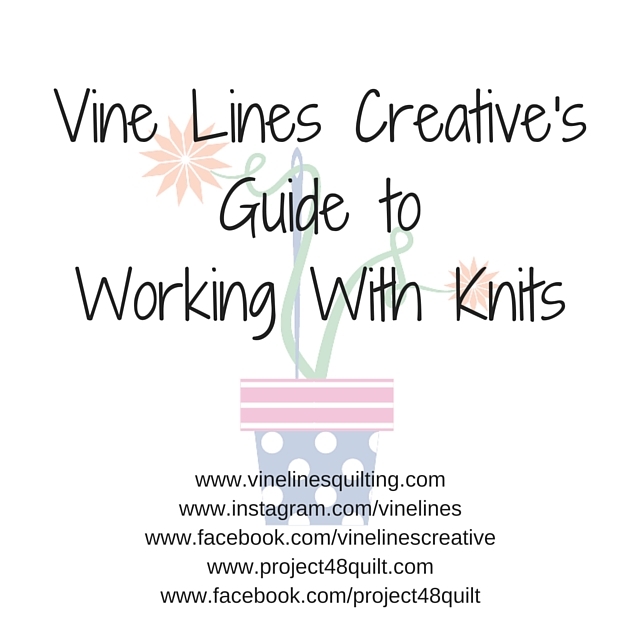 Here then is my Beginner’s Guide to Sewing with Knits, so that you don’t make the same mistakes I did! Make sure you’ve got a ballpoint needle in your overlocker. If you use a sharp or universal needle, it will break the fibres in the fabric and cause ladders, just as in a knitted jumper. 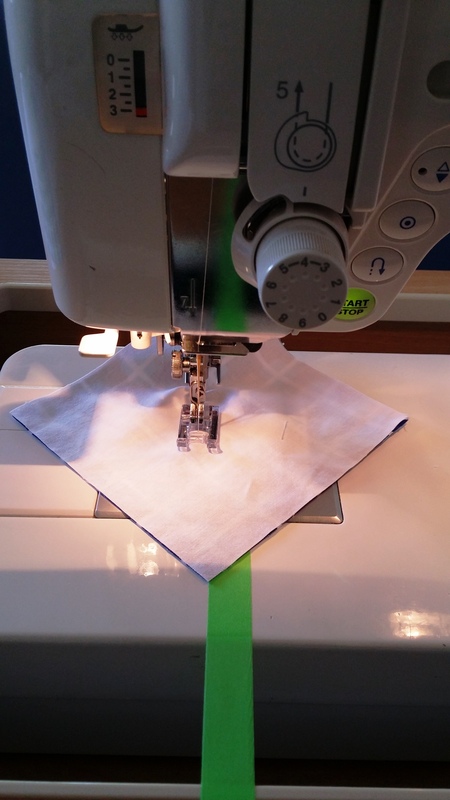 Make sure your sewing machine is set to stretch/lightning or zig zag stitch. You can’t use a normal stitch because it won’t stretch with the fabric and will cause breakages and puckers. Have you chosen a pattern suitable for knits? If you sew a knit pattern in woven fabric, it will come out too small; if you sew a woven pattern in knit fabric it will come out too big. Have you printed and taped the correct pages (for PDF patterns)? Have you prewashed your fabrics? Is the stretch going in the right direction? Is the pattern going in the right direction? Are you using the correct seam allowance? Have you selected the rolled hem setting/changed the plate? Have you altered the tension? Have you removed the fourth (left needle) thread? I’ve created a printable for you to pin up in your sewing room – I do hope you find it useful. 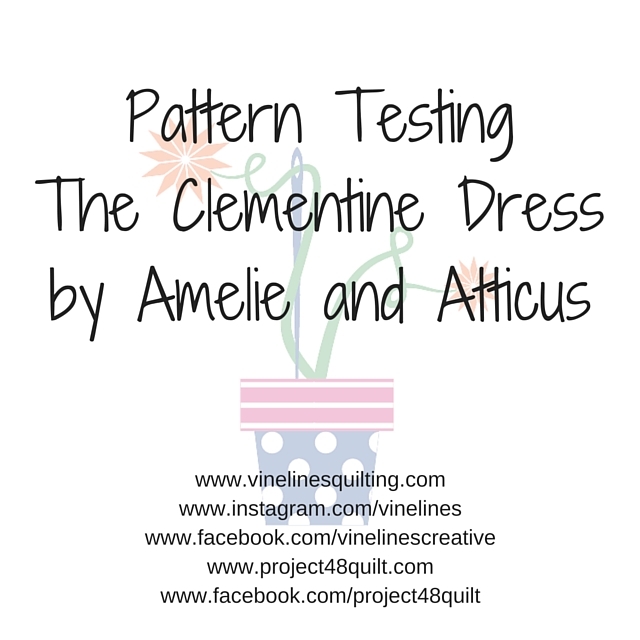 I recently had the pleasure of pattern testing Amelie and Atticus’ new Clementine Dress. 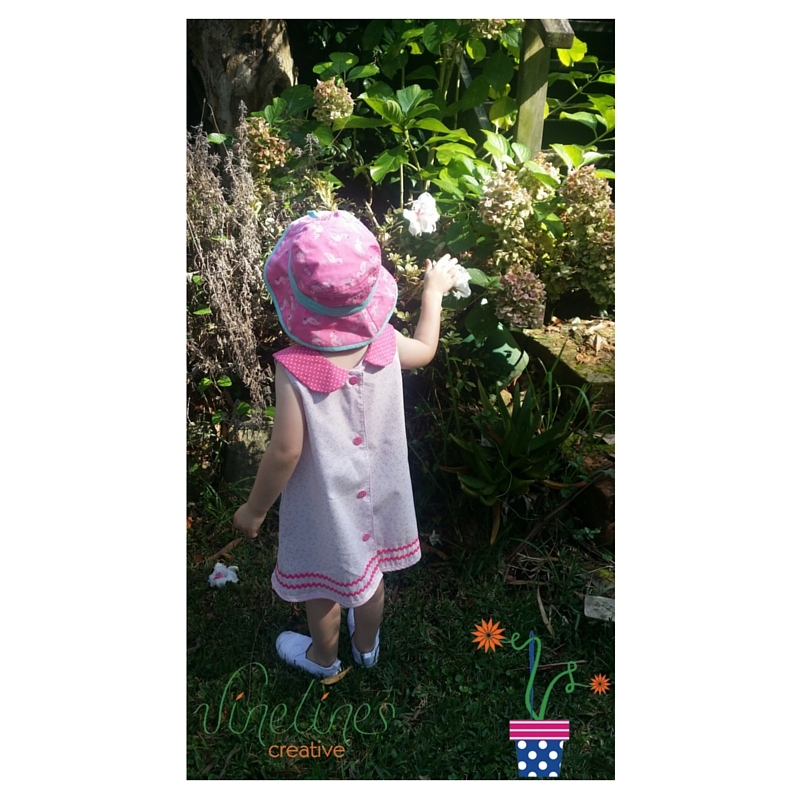 I love a Peter Pan collar on a small person and it’s the sort of dress that can grow with the child – it will become a top rather than a frock as Curious Miss gets taller. It was quite a straight forward make when I finally got the front and back sitting properly. This was purely operator error – I managed to stitch the left and right together the wrong way around so the side seam was meeting the back seam – grr! 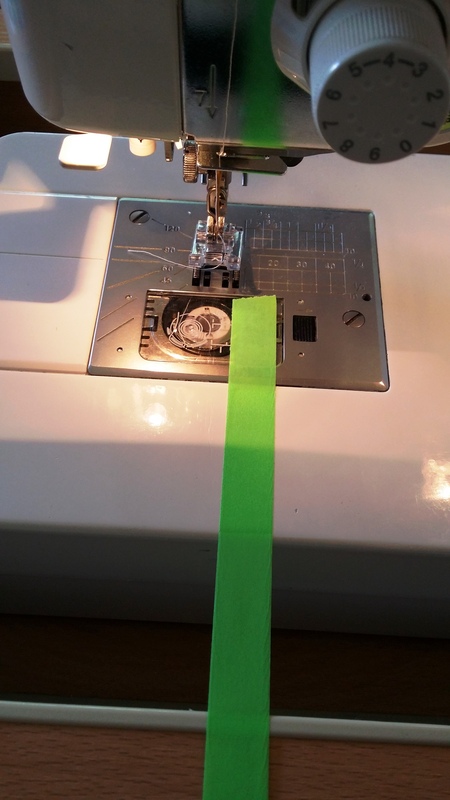 Because I sew all my clothing using the overlocker, unpicking it was not a lot of fun. Moral to the story: don’t sew when tired! I added two rows of ric rac and finished the bottom hem with bias binding – I found just the right colour of ric rac at work and it sets it off beautifully. My daughter is 4½ so I made the Size 4; it’s a little big but she will grow into it. It would have been great to have the measurements for each size included in the pattern but with a pattern such as this one, it doesn’t matter if it’s a little big as I mentioned. The other thing I would change next time I make it is to fully line it rather than just adding a facing; if you stitch the collar in carefully it would then become a completely reversible dress. I cut the fabric very carefully so used a lot less fabric than the pattern suggests, however you would certainly need more if you used a directional fabric. 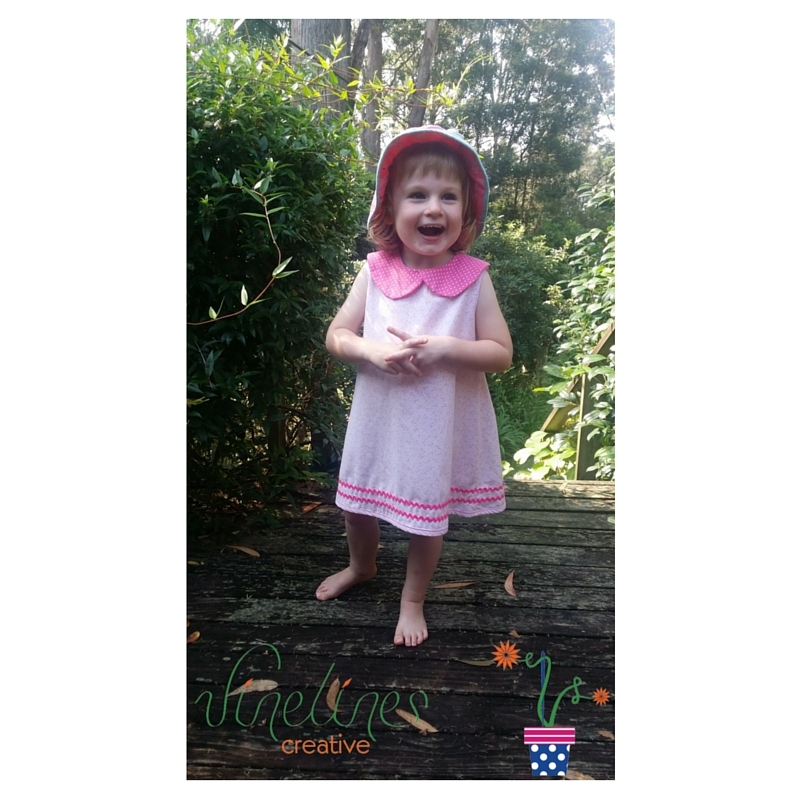 Amelie and Atticus is having a stitch-a-long this week; check out her website for the details and jump right in! This is a great pattern for confident beginners; Curious Miss loves it and I’ll certainly be making more of them. 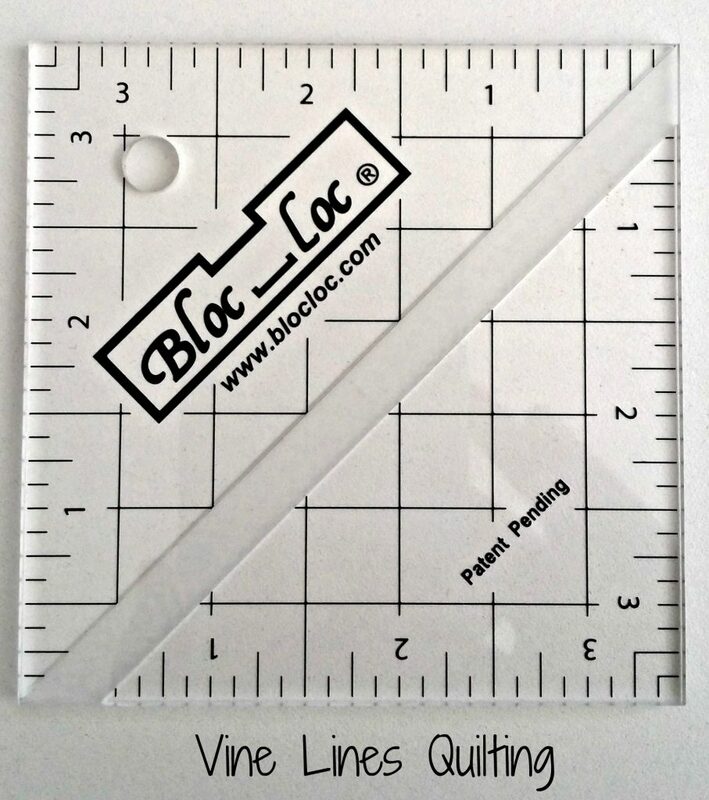 Do you have a clothing or quilt pattern you would like me to test/review? Contact me using the form below; I’d love to work with you to promote your pattern. These fees are payable for simple – intermediate patterns; more complex patterns will attract higher fees. Would you like me to take the pain out of the pattern testing process? Contact me at (linden at vinelinescreative dot com) to make a booking. For the past two days I’ve been at an intensive business workshop. I’ve learned an awful lot about digital marketing, lead funnels, sales strategies and quite a bit about myself. One of my fellow attendees is a professional organiser and works with people to de-clutter their spaces, which got me thinking about why I have clutter. I’m not an overly neat person, and at nearly 30kg overweight I have ‘body clutter’ as well as house clutter. I know exactly when I started putting weight on, to the day. You see, being fat is my safe space. When I was five and again when I was 11, I was interfered with by two different men in two different circumstances. The first was by a curate at a church weekend away and the second was in a park on the way to school. I have done a lot of work over the years “getting over” these two events but I’ve come to realise, especially over the last two days, how much of a hold these events have over my life. When my mother approached the curate’s boss after the first event, she was told in no uncertain terms “imagine what it would do to this man’s career if this got out”. Watching the reporting of the royal commission into institutional responses to child abuse has brought this to the surface again, as has my recent attempts to lose weight. I was a slender child until the second instance occurred and then I started stacking on weight and have been continuing to do so for nearly 30 years. My thought pattern was thus: “I was skinny when I was abused (twice), therefore skinny people get abused, therefore if I’m fat that won’t happen again so I need to be fat because it’s my safe place. I realised this weekend that continuing to be overweight gives the men who did the interfering a control over my life that I am no longer prepared to allow anyone other than God to have. Whilst I had absolutely no control over the events themselves and am not to blame for them, I have complete control over the body clutter that has eventuated. It’s time to take back control of my body and my life. As soon as I came home from the workshop I got to sorting my clothes, like a boss! I got rid of three garbage bags of clothes and I put one bag of clothes that I very much like but that are too small in the cupboard. I’ve given myself until this time next year to fit into them and what doesn’t fit then is going. I don’t know what I expected to take away from this weekend but it certainly wasn’t that. On a business note, I have also come home with some very practical business building tips and an awesome support network. Building a profitable business feels much more achievable when you know you’ve got people around you watching your back. I highly recommend joining a mastermind group and finding your ‘tribe’; it’s such a worthwhile investment. 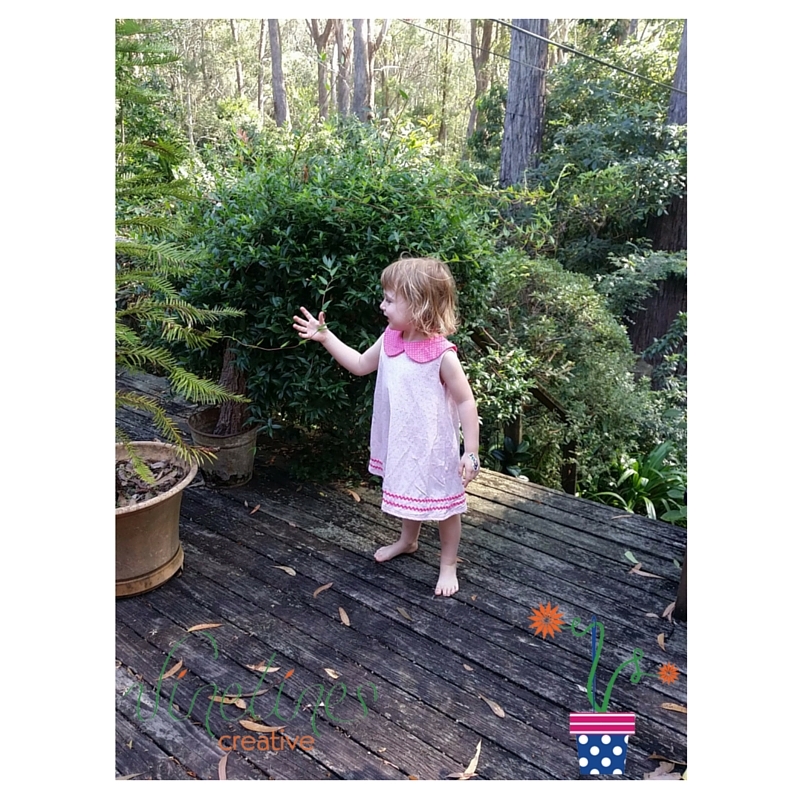 I can’t remember how I first met Sam; I’ve been following her on Instagram for quite some time, and this year I’m lucky enough to be part of the Aussie Blossoms Birthday Club which she runs in conjunction with Sharon (@lilabellelane). I also tested her gorgeous Breeze pattern earlier this year; I’m really looking forward to seeing more patterns from her.